In a medium bowl, stir Enchilada Sauce ingredients and set aside. In another medium bowl, combine Chicken ingredients, mix with your hands and let marinate for 5 – 10 minutes while you are slicing zucchini. Preheat large skillet on medium heat and add chicken. Cover and cook for 10 – 12 minutes, turning once. Let cool a bit, transfer to a cutting board and shred using 2 forks. Preheat oven to 375 degrees F. In a medium 8″ x 11″ baking dish add a few tablespoons of Enchilada Sauce, spread to coat and sprinkle with 1 tbsp of quinoa. 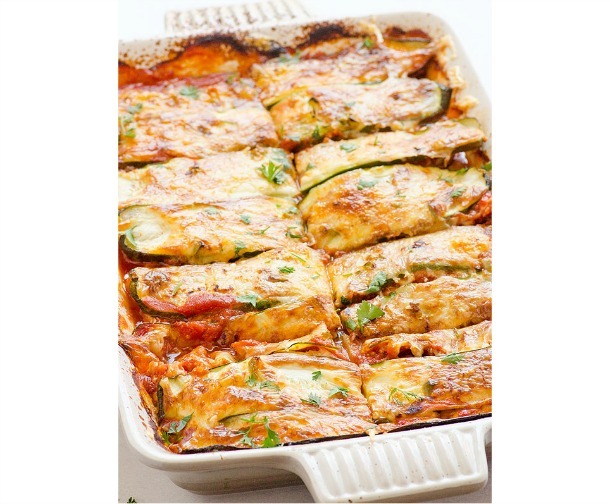 Place sliced zucchini widthwise (cut some slices in halves to fit into the end of the dish) overlapping a bit to create a single layer. Spread half of chicken, then half of Enchilada Sauce, top with half of cheese and jalapenos, and sprinkle with 1 tbsp quinoa. Repeat another layer, finishing with a layer of zucchini and sprinkling cheese on top. Storage Instructions: Refrigerate in an airtight glass container for up to 5 days. Do not freeze.